Last month the UN World Food Programme (WFP) held a meeting in Rome to discuss strategy for fighting a growing hunger crisis in Yemen. The WFP’s executive board approved a $32 million budget increase for its plan to distribute rations to families suffering from high food prices. The total budget for this 2011-2012 operation stands at over 122 million dollars. While WFP approved the budget increase, it all hinges on whether donors come through. The World Food Programme relies entirely on voluntary donations from governments and the public. 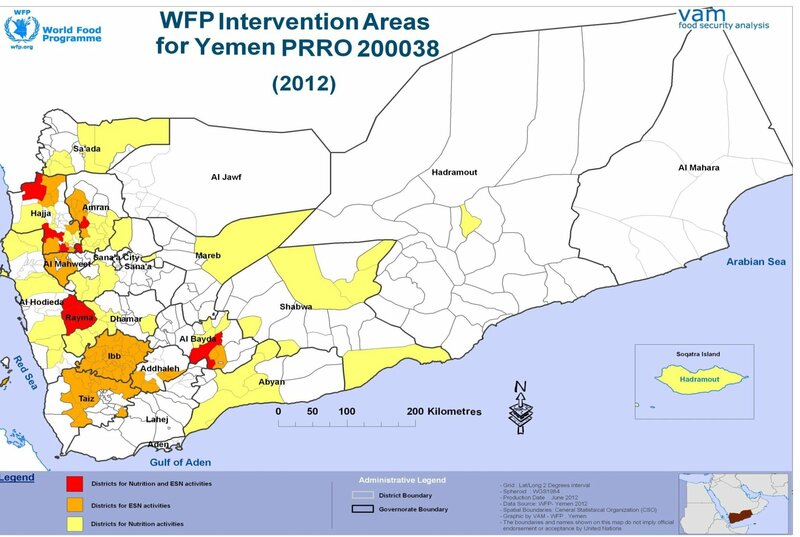 In 2011, for example, WFP planned to feed 1.8 million Yemenis as part of the aforementioned safety net operation. Funding was low and some entire governorates had to be dropped from the program. At one point over a million Yemenis did not even receive the food rations during a scheduled distribution. The low funding for WFP Yemen unfolded at the same time food prices increased during political instability. It’s important to remember that even before the year of unrest in Yemen took shape, millions were already deeply mired in hunger and poverty. The turn of events during Yemen’s “Arab Spring” took a bad situation and made it worse. WFP will also need funding in 2012 to feed Yemenis displaced by conflict both in Northern and Southern Yemen. Food for education programs, which have received almost no funding for two years, need to be restarted. No national school lunch program has been established, nor a universal infant feeding program. These programs can provide a way to defeat malnutrition among children and also increase literacy, class attendance and most importantly completion of education. In addition, Food for Work projects to help agricultural rehabilitation need to go forward. But it all depends on whether the international community will donate. Yemen cannot achieve political stability and peace amid a storm of hunger. Despite this reality, hunger fighting programs lacked funding in 2011. Will the new year be a repeat? There is some hope. Germany recently made a 30 million dollar donation to WFP in Yemen. Will other nations follow this lead and help provide food security for Yemenis during a period of political upheaval? That is a critical question as 2011 comes to a close. It takes on even more urgency when you consider that the United States Congress is proposing reducing funding for the Food for Peace and McGovern-Dole school lunch programs. Both are potential major resources for funding hunger relief in Yemen. If they are cut back, it could prove to be very damaging during the coming year where so much is on the line in Yemen. Article first published as Plotting the 2012 War Against Hunger in Yemen on Blogcritics.